Heat the oven to 400°F. Line a baking sheet with parchment paper. Beat the egg and 1 tablespoon water in a small bowl with a fork. Heat the butter in a 12-inch skillet over medium heat. Add the apples and cook for 8 minutes or until tender, stirring occasionally. Stir in the cranberries, walnuts, sugar, 1 teaspoon cinnamon, 3/4 teaspoon cardamom, the ginger, nutmeg and salt. Remove the skillet from the heat. Let the apple mixture cool for 30 minutes. Sprinkle the flour on the work surface. Unfold the pastry sheet on the work surface. Roll the pastry sheet into a 10x15-inch rectangle. Cut the pastry into 6 (5-inch) squares. Spoon about 1/3 cup apple mixture in the center of each pastry. Brush the edges of the pastries with the egg mixture. 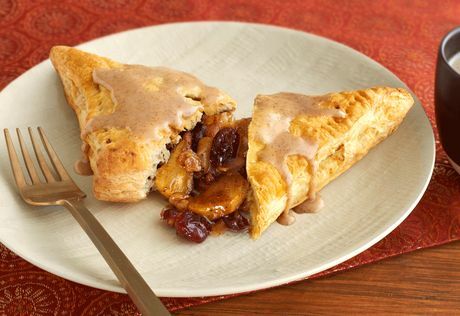 Fold the pastry in half over the filling to form a triangle. Crimp the edges with a fork to seal. Brush the filled pastries with the egg mixture. Using a sharp knife, cut a small slit in the top of each pastry. Place the pastries onto the baking sheet. Stir the confectioners' sugar, remaining water, cinnamon, cardamom and the vanilla extract in a small bowl. Drizzle the sugar mixture over the pastries.